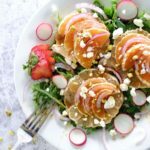 Sometimes the sun just comes out, and all I want to do is eat fruit and citrusy things, so I decided to make this summer citrus salad to mix up our salad game and to enjoy the summertime vibes. It is light and crisp, yet earthy and perfect for the summer. But first, I have to make a confession as I embark on this story. I have not always liked goat cheese, and you may be thinking it is not even Paleo. You are correct; it is not fully Paleo. However, it is also not cow dairy which is what most people have an intolerance to. So, live a little and give it a try if you are feeling daring. If you know you don’t tolerate it well, go ahead and leave it out. But seriously, check out the layers and textures of this summer citrus salad. There are so many things going on that I love. I especially love the spectrum of flavors from the spicy arugula, earthy radishes, sweet oranges and grapefruit to the tangy goat cheese and crunchy pistachios. And it is all on one plate. So good! Scoop up a little bit of everything in each bite. It is a light and refreshing salad you can pair with just about any meat you are making. We enjoyed it recently with slightly charred grilled beef patties, and it was pretty much perfection. Go ahead. 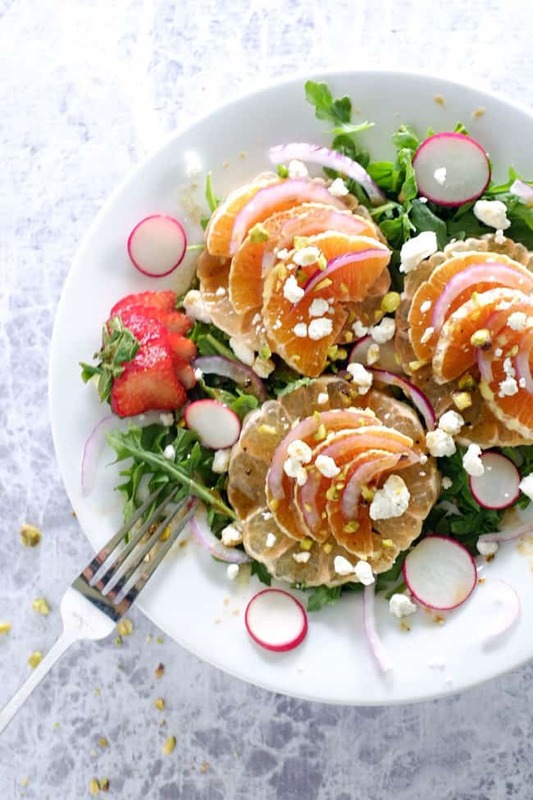 Get a little crazy and try this summer citrus salad. Leave a comment below and let us know what you think. Also, take a picture and tag it on Instagram @realsimplegood so we can check it out! Start by making a batch of our everyday salad dressing if you don't already have some in the fridge, or you can use a similar balsamic type dressing if it is more readily available. Then, thinly slice your orange, grapefruit, radishes, and red onion. If you are just making one salad you definitely won't need the entire grapefruit, orange or quarter of red onion, but should be able to get 2-3 salads if you used them all. You'll also want to chop up your pistachios into smaller pieces. Get to putting your salad together. Put a bunch of arugula down on a plate, and then start layering things. I like to do the grapefruit next, then add the oranges on top of the grapefruit. Put some red onion slices on top and maybe a few sprinkled around, and then add the radishes throughout. Crumble the goat cheese all over (if you like that sort of thing), and sprinkle your pistachio pieces. Finally, top with your dressing. Grind some salt and pepper right on top, and call it good. Eat up! 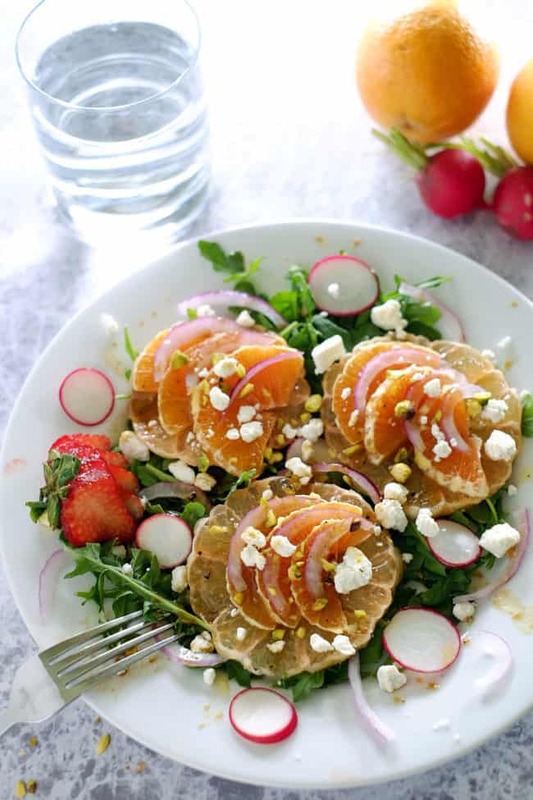 Enjoy this light and crisp summer citrus salad! Oh my goodness! What a beautiful salad. Just stunning! This salad looks perfect…very refreshing . Wow. This salad looks so beautiful!